Lisbon Airport to Estoril - Updated for 2018! Lisbon Airport to Estoril - Fully Updated for 2018! 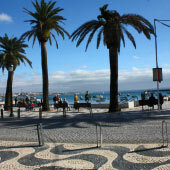 Estoril is a sophisticated and stylish beach resort that is situated along the beautiful Lisbon coastline. The main international airport of central Portugal is Lisbon airport and for a guide to this busy airport please click here. 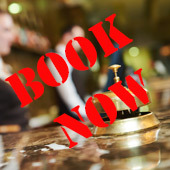 Lisbon airport is 30km to the east of Estoril, and a pre-booked transfer will cost between €40-50 whereas a taxi hired from the arrivals lounge will be significantly more, at around €70. A much cheaper option is to use public transport and this journey is relatively easy, requiring two metro connections and one train journey. 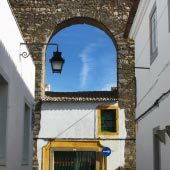 This guide will provide a detailed description of how to travel from Lisbon airport to Estoril by public transport. Lisbon airport is located within the city limits, and is only 8km north of the historic and popular tourist district of Baixa. 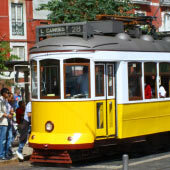 Estoril is connected to Lisbon by the Cascais regional railway, and this departs from the Cais do Sodré train station. 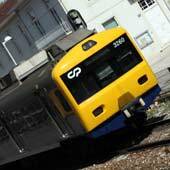 The journey from Lisbon Airport to Estoril by public transport is divided into two distinct sections; the first stage of the route is from the airport to the Cais do Sodré train station while the second stage is from Lisbon to Estoril by train. The entire journey to Estoril takes between 60-90 minutes, depending on connections and the total cost is less than €7.00. 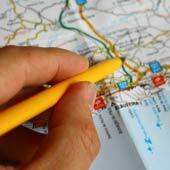 The following section explains in detail both stages of the journey to Estoril. The beaches of Estoril are worth the effort! Cais do Sodré is the departure train station for the Lisbon to Cascais railway, which serves all of the resort towns of the Lisbon coastline, including Estoril. The Cais do Sodré station is to west of the central Lisbon, and to travel there from the airport requires either the metro, a specialist bus service called the Aerobus or a taxi ride. We prefer taking the metro as it is modern, reliable and the cheapest option, but a connection is required and this is inconvenient if traveling with bulky or heavy luggage. A taxi ride is the fastest method to reach Cais do Sodré and is suitable for groups or families. Lisbon taxis are inexpensive when compared to the rest of Europe, but are notorious for fleecing tourist on airport fares. A single journey to the station should cost around €10-€15 Euro, plus €1.50 for luggage (not per piece of luggage). Always check that the meter is on before leaving the airport, or at least having an agreed price. The Estoril train is a regional service therefore tickets cannot be pre-booked, but there is no need as there are always plenty of seats. Tickets must be purchased before boarding the train, either from the ticket office or from the automated ticket machines, these have English instructions. The train journey to Estoril is very scenic as it passes through the pretty Belém district and then along the coastline providing wonderful views over the Rio Tejo estuary. 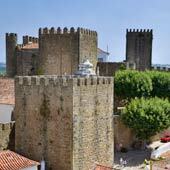 A taxi from Lisbon airport to Estoril is an expensive means of travel, as Estoril is outside of the city limits. 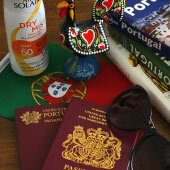 If you are considering using a taxi, it is advisable to pre-book the airport transfer before arriving in Portugal. Airport transfers provide convenience, especially when travelling as a large group with children. The journey from Lisbon airport to Estoril takes about 40 minutes, depending on traffic.